Hawaiian Falls is grateful to have had the opportunity to give a wish-granting experience that gave hope to a child battling cancer. 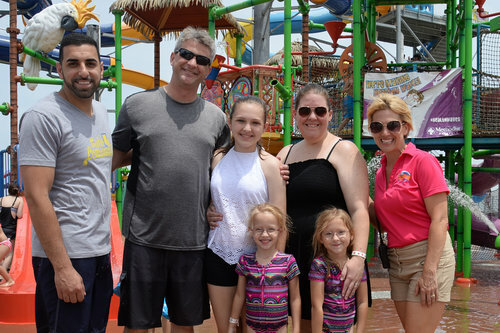 Five-year-old Isabella Day of Dallas and her family took a break from all the doctor visits and cancer treatments to have a fun-filled day at Hawaiian Falls Mansfield. Isabella was diagnosed with stage IV neuroblastoma at only nine months old. Surgery, chemotherapy and all other treatments have been ineffective in controlling Isabella’s cancer. For one special day, the family just wanted Isabella to enjoy being a child and have fun. In support of Alex’s Lemonade Stand Foundation, Power Home Remodeling adopted Isabella and her family as their local HERO family. They took care of all expenses so the entire family could focus on making memories. The Hawaiian Falls “ohana” is dedicated to our mission of bringing families closer together, and is thankful to have been able to share the “aloha spirit” with Isabella. Mahalo to all the people involved in making this day special for Isabella and her family.